I never got the chance to see the Disney and Pixar film Inside Out in theaters like I wanted, the trailers looked great but I just didn't have the time. Now that it's on blu-ray I finally got to see it, and it is indeed a very good film. It's not as lighthearted and comical as other Pixar films as the story is about an 11 year old girl named Riley that starts suffering from depression after her family moves to a new city. The story is told mostly though characters representing emotions inside Riley's head, similar to that old TV show called Herman's Head, and it's a technique that works very well. We get to witness how her various emotions interact with each other and which ones win out. Starting out, Riley has a positive outlook about the move despite having to leave all her friends behind. This emotion, Joy, is able to keep her other emotions in check for a while, but before too long Riley starts having some bad experiences and slowly Sadness starts to infect Riley's memories. Joy does her best to stop this, but in doing so causes both of them to become separated and lost in long term memory. This leaves just Fear, Disgust, and Anger in control while Joy and Sadness try to get some of Riley's core memories back to headquarters. It's cool how the story unfolds on three fronts, from Riley's point of view, from her emotional point of view, and from Joy and Sadness' point of view. It's much more of an emotional movie than any other Pixar films and I think geared toward old children and adults. Don't think it's all depressing though, far from it. It's very funny in fact. Both Amy Poehler and Phyllis Smith are fantastic as Joy and Sadness. They play very well off of each other. Actually, all the voice actors are great. Lewis Black as Anger, Bill Hader as Fear, Mindy Kaling as Disgust, all perfectly casted. In addition to the film, this blu-ray also includes an all new short called Riley's First Date? which is great, and way more lighthearted than the film. It made me really hope that they make another movie. But that's not the only bonus feature, there's actually quite a bit here and it's all enjoyable to watch. 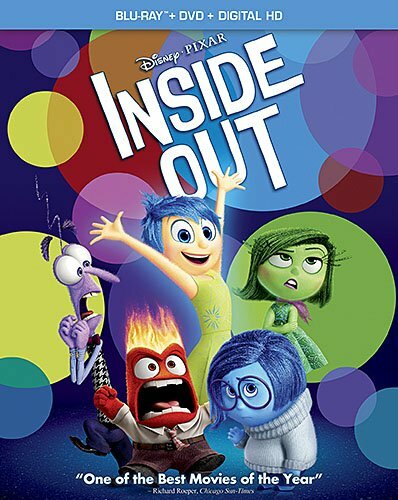 Inside Out (Blu-ray + DVD + Digital HD) , released by Walt Disney Video, is available starting November 3, 2015.